The shows will be based on the following Marvel characters: Howard the Duck, M.O.D.O.K, Hit-Monkey, and Tigra and Dazzler. Like the Marvel-Netflix "Defenders" shows before them, the four characters will then team up in the animated special "The Offenders." Marvel's head of TV, Jeph Loeb, will executive produce each project. Disney-which owns Marvel-will become a majority shareholder in Hulu once the Fox-Disney merger is completed. 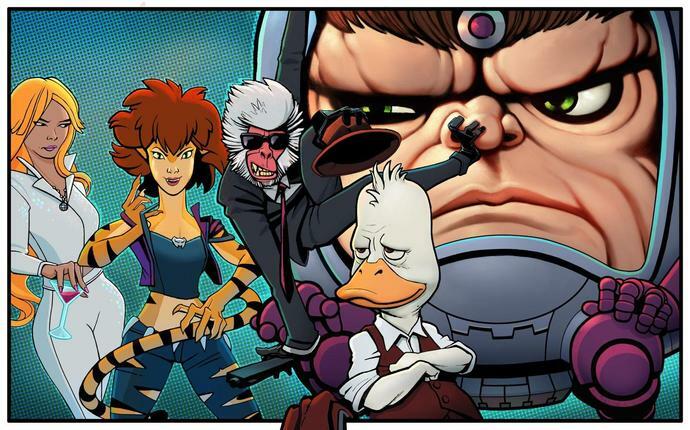 "Howard the Duck" will be written and executive produced by Kevin Smith and Dave Willis. Smith is known for his Askewniverse films, including "Clerks," "Mallrats," and "Jay & Silent Bob Strike Back." Smith has also written for Marvel Comics in the past, writing for popular characters like Daredevil and Spider-Man. Willis previously co-created popular animated shows like "Aqua Teen Hunger Force" and "Squidbillies" for Adult Swim in addition to his work as a voice actor. In the series, Howard the Duck is trapped in a world he never made, but America's favorite fighting fowl hopes to return home with the help of his unstoppable gal pal Beverly before the evil Dr. Bong can turn him the crispiest dish on the menu. "M.O.D.O.K." will be written and executive produced by Jordan Blum and Patton Oswalt. Blum's previous credits include "Community" and "American Dad." Oswalt is an Emmy-winning stand up comedian. He currently appears on the NBC series "A.P. Bio," the Syfy series "Happy!," Netflix's "Mystery Science Theater 3000," and serves as narrator on ABC's "The Goldbergs." "M.O.D.O.K," or Mental Organism Designed Only for Killing, centers around an egomaniacal supervillain with a really big head and a really little body, who struggles to maintain control of his evil organization and his demanding family. "Hit-Monkey" will be written and executive produced by Josh Gordon and Will Speck, the team that previously co-directed films like "Blades of Glory" and "Office Christmas Party." They are repped by CAA and Management 360. "Tigra & Dazzler" hails from writers and executive producers Erica Rivinoja and Chelsea Handler. Rivinoja worked on the story for the film "Girls Trip" and her previous writing credits include shows like "The Last Man on Earth," "South Park," and "Grounded for Life." Handler is known for hosting her own talk shows on both E! and Netflix, "Chelsea Lately" and "Chelsea" respectively. News of these new animated series comes as three of the four original live-action Marvel Netflix "Defenders" shows-"Daredevil," "Luke Cage," and "Iron Fist"-have all been cancelled within the past few months. The fourth show, "Jessica Jones," is expected to air its third season in 2019. As Variety exclusively reported, the deal for the original four shows includes a clause that prevents the characters from appearing in any non-Netflix series or film for at least two years after cancellation. A fifth show, "The Punisher" starring Jon Bernthal, debuted its second season in January and a decision regarding its future is still pending.